Brooklyn-based nonprofit SaveArtSpace is pleased to present "Animal Instinct" a cross-media exhibition and public art initiative curated by two of the NYC art community's most vocal animal advocates: street art tastemaker Raquel Arnao (@ArtDogNYC) and performance artist Mother Pigeon. The exhibiting artists include Alexis Kandra, Cheryl Gross, Elin Menzies, Kantapon Metheekul and Praxis. 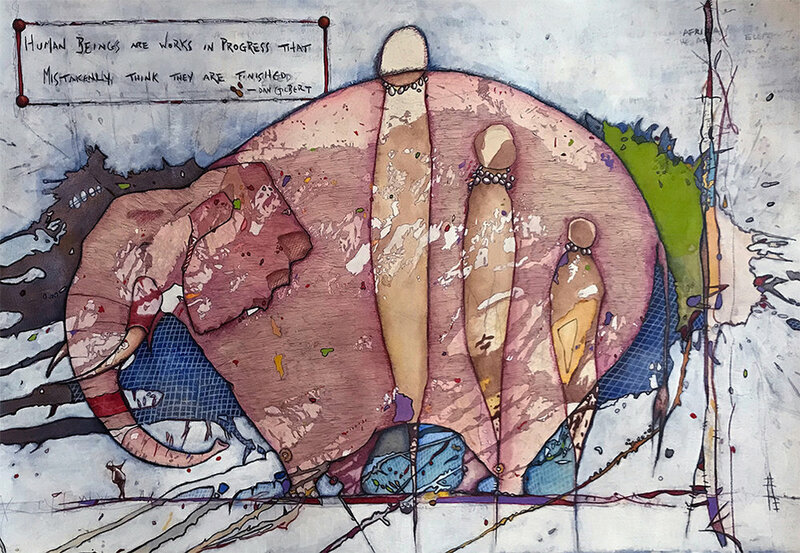 "Animal Instinct" is a celebration of the animal kingdom, as well as a call for the humane and ethical treatment of all creatures, big and small. From cave paintings by ancient civilizations to cat memes of modern times, animals have long served as a great inspiration for art, imbued with symbolism about strength of character, primal instincts, survival mechanisms, evolution, and our relationship with the natural environment. Whether furry, feathered, finned or flippered, animals enrich the lives of human beings in countless ways. This exhibition presents a loving, respectful portrayal of the creatures we share our planet with, both domesticated pets and wildlife. During the week of August 6th, SaveArtSpace will launch public art installations for each selected work on advertising spaces throughout Brooklyn and Queens. A weekend pop-up exhibition will mount at Tribeca-based gallery One Art Space on Friday August 10th, with a reception set for that evening at 6-9pm. Elin Menzies is a painter and cut-out artist who believes art provides spiritual oxygen for the earth. Menzies studied painting and sculpture at Bennington College, the University of Hawaii, the Art Students League and Massachusetts College of Art. Her awards include the Kuniyoshi and Jacobs/Towbin from the Woodstock Artists Association and Museum and an Artists of the Northeast award from the Silvermine Arts Center. She has participated in solo, invitational and juried exhibits at the Samuel Dorsky Museum, Kleinert James Center for the Arts, Woodstock Framing Gallery, Arts Mid-Hudson Gallery, Arts Society of Kingston, Greene County Council of the Arts and other galleries and venues regionally and nationally. 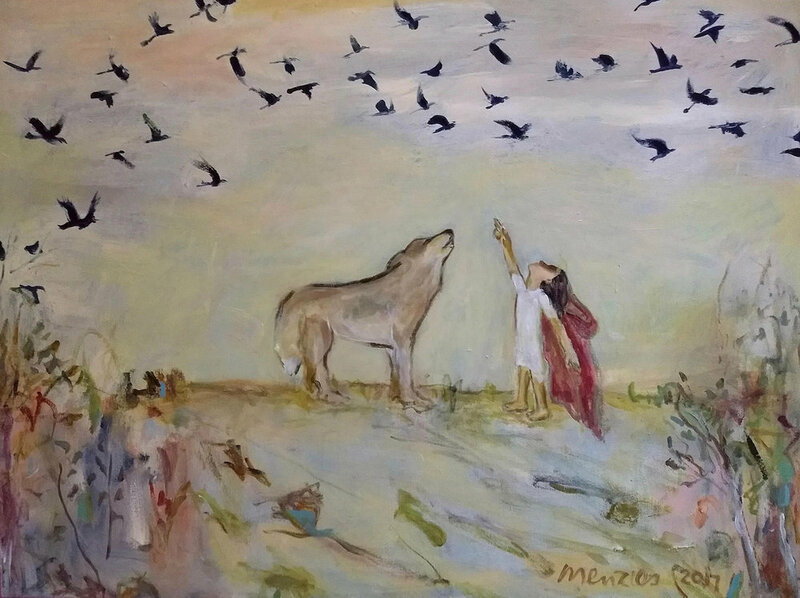 Artist Statement: This painting, Crows Above, depicts Red Riding Hood and the Wolf enjoying a moment together as they watch a flock of crows fly over. It is from a series called Wolf Crossing in which the paintings represent a revision of the classic tale of Red Riding Hood where the wolf is used as a metaphor for something evil. In my version Wolf is a hero who rescues the orphaned Red Riding Hood and takes her to live with and be protected by him in the forest of Wolf Crossing. There is a story that goes with the series on my website, www.elinmenzies.com. Wolf Crossing, and much of my work, is rooted in the seemingly disparate areas of mythology and scientific research on inter-species communication. Our evolving understanding of animals fosters connections that bring a restorative balance to the human psyche and illuminates the need to protect wild animals under the Endangered Species Act. Wolves are important in keeping wilderness balanced and healthy, which in turn protects the environment for humans. Kantapon’s creativity extends from advertising to digital art to fine arts.His ability to create various styles of works have won him many advertising awards across the world from Cannes Lion to Clio and Spikes Asia. Obsessed with arts, Kantapon finds inspiration in his hand-drawn illustrations in everyday life, fashion and people’s relationship. He has also illustrated for high-street and luxury fashion brands and has been featured in several publications. His works display on a wide range of medium from digital painting to street art. Artist Statement: We all wish we could fly like a bird. Pursuing for freedom and trying to be unchained with the modernist society. Our instinct are calling us. Alexis Kandra grew up in Pittsburgh PA with a passion for art-making and the natural world. As a child, she took art classes at the Carnegie Museum of Art and Natural History, which fostered her love of dioramas, biodiversity, and searching for our place in the universe. She received her BFA in painting from Tyler School of Art in Philadelphia in 2013. After graduating and moving to New York City, Alexis began making paintings that combine surreal animal arrangements with abstract geometric spaces. She has exhibited in galleries across the United States. Artist Statement:Alexis Kandra's paintings are portals into surreal parallel worlds, with unlikely animal interactions and theatrical settings. The animals exist inside spheres of life. They intersect and move like the atoms of a molecule or the orbits of planets. The grids act as another dimension, or unseen structure that connects everything together. Each painting tells a story about how complex and beautiful life can be. To bring animal rights issues to the city through stencil art has been the main focus of NYC based stencil artist Praxis from Bogotá, Colombia. Paper, exacto blades, spray paint and creativity are the tools that turns stencils into a delivery message system out on the streets. Influenced by punk rock, animal liberation, cartoons and graffiti, each piece tries to make it into a protest message. Artist Statement: Jaguars are still sacred among many Central and south American communities, and where seemed as gods by the ancient indigenous cultures that shared territory with it. The jaguar doesn't just play a very important roll balancing nature but it's also a magnificent and unique animal which has been threatened for years by the agriculture and cattle industry that's destroying their's and many other animals home, burning vast territories of land to expand their operations. 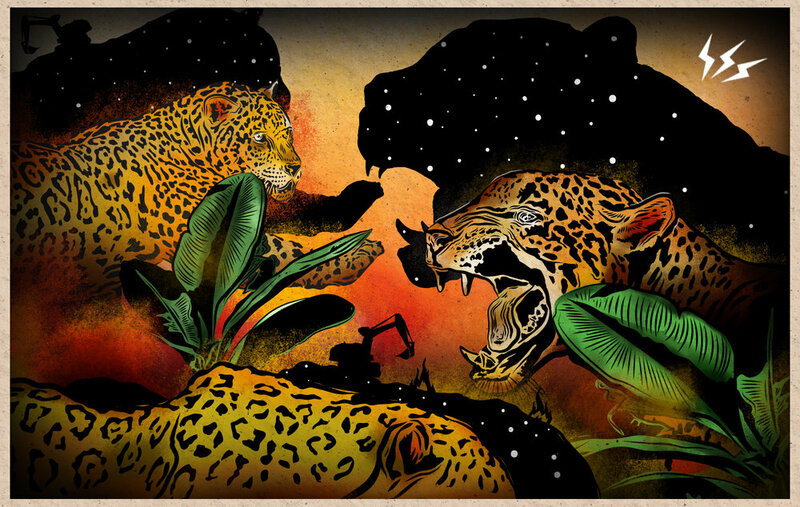 Lack of regulation and excessive exploitation of resources has led the number of jaguars and other species to drop drastically over the past years. Lets wake up, care and share so maybe one day we'll be enough to make a change. Born and raised in Brooklyn, New York, Cheryl Gross is an illustrator, painter, and motion graphic artist living and working in the New York area. She is a professor at Pratt Institute and Bloomfield College. My life experience was devastating. That coupled with my mother’s death and having to sell my house was indeed a test to my sanity. So much so, I lost all interest in listening to music. Being the social creature that I am, I needed to listen to something, so I turned to WNYC, NPR. Penetrating psyche, political, steeped in metaphor, comic-like style allows the viewer to digest and interpret complex issues we must endure as a society. The work centers on political/social commentary that involves such issues as animal cruelty, gender obliteration, the LGBTU community and the effect that globalization/gentrification have on our society. Until now, these topics have not been accepted and considering our present political climate, may very well be in jeopardy. In my series, The Karpland Chronicles (My Very Existence, My Life in the World, Seemed Like a Hallucination, a quote by Haruki Murakami), mirrors our present socio-political climate that has sparked a “cold” revolution, as well as theend of American democracy, as we know it. My materials include water based mixed media: I start by spilling coffee onto my surface, (this lays down the foundation and design of the work), gouache, water color, acrylic, graphite, ball point, India ink, color pencils, on paper. The work is colorful, sizes range but mostly 22”X30” 40”X26” format, and somewhat resembles a graphic novel/comic book type format, combing figurative as well as abstract imagery. My layering process includes writing that I incorporate and use as mark making. It also helps to carry the narrative.